Interstate 278 travels northeast along the elevated Brooklyn-Queens Expressway (BQE) toward the Robert F. Kennedy (Triborough) Bridge in Brooklyn. Predating the Interstate Highway System, the BEQ was built in sections starting with the Kosciuszko Bridge in 1939 and ending with a segment near the Brooklyn Navy Yard in 1960). Photo taken 08/09/04. Interstate 278 begins in an industrial area between Linden and Elizabeth from a partially built interchange with U.S. 1 and 9. The freeway spurs east to the New Jersey Turnpike and Goethals Bridge approach to Staten Island, New York. 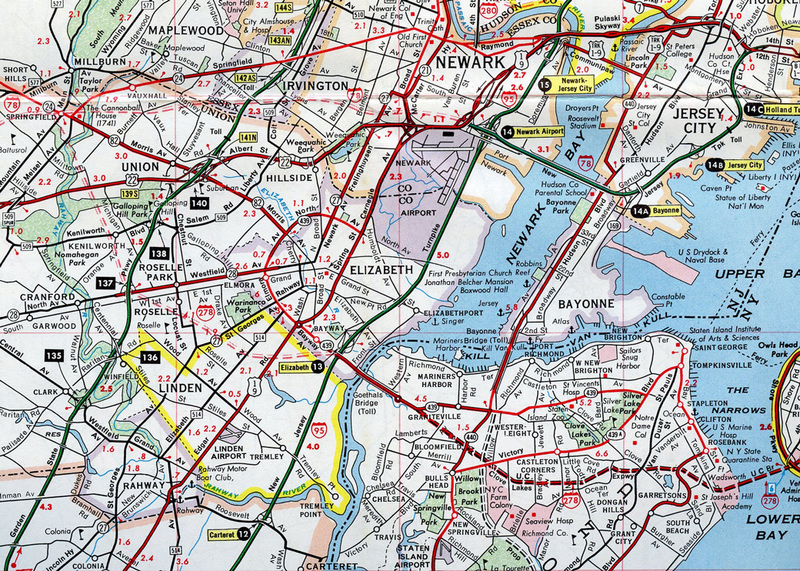 Interstate 278 enters all of New York City’s boroughs: Staten Island, Brooklyn, Queens, Manhattan, and Bronx. I-278 connects to Manhattan because Wards Island, where the Triboro (RFK) Bridge is partially located, is part of the borough of Manhattan. Like Interstates 478, 678, and 878, I-278 does not meet the parent route Interstate 78. An older, urban freeway, Interstate 278 offers excellent views of the Manhattan skyline. The freeway uses several bridges on its journey, including Goethals Bridge between New Jersey and Staten Island, the Verrazano-Narrows Bridge between Staten Island and Brooklyn, Kosciuszko Bridge between Brooklyn and Queens, and the Robert F. Kennedy (Triboro) Bridge between Queens, Manhattan and the Bronx. 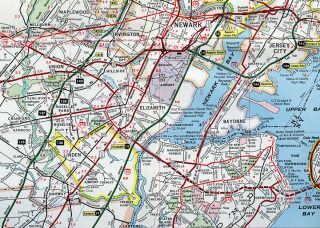 Interstate 278 also carries several different names, including the Staten Island Expressway, Gowanus Expressway, Brooklyn-Queens Expressway (BQE) and Bruckner Expressway. The Verrazzano Narrows Bridge, which connects Staten Island with Brooklyn, opened to traffic on November 21, 1964; a second six-lane deck below the original deck was opened on June 28, 1969.1 Photo taken by Cesar Centano (08/22/08). Unlike most Interstates, I-278 carries a truck prohibition for a portion of its route; specifically, trucks must use the frontage roads parallel to the Grand Central Parkway section through Astoria, Queens. I-278 concludes at the massive Bruckner interchange, where it converges with Interstates 95, 295, and 678 as well as Hutchinson River Parkway. The planned alignment of Interstate 278 leading north from Linden to Springfield in 1961. The western leg of I-278 was formally dropped in 1967 due to costs. A narrow steel truss bridge with just four lanes and no shoulders, the Goethals Bridge connected Elizabeth, New Jersey with Staten Island, New York as part of Interstate 278. The bridge opened to traffic on June 29, 1928 after three years of construction. The $1.5 billion project to replace the aging span got underway officially on May 7, 2014. The public-private partnership constructed a new cable-stayed bridge featuring V-shaped towers supported by 144 stay cables. The $130 million Goethals Bridge Interchange Ramps Project redesigns the connection at the west end of Interstate 278 with U.S. 1 & 9. Managed by the Port Authority of New York & New Jersey and the New Jersey Department of Transportation (NJDOT), the two phase project will add ramps from I-278 west to U.S. 1/9 north and from the U.S. 1/9 south to the freeway east. Planning and preliminary design work started in late 2013. Final design is anticipated by late 2019, with construction underway from spring 2022 to spring 2024. Predating the Brooklyn Queens Expressway (BQE), the Kosciuszko Bridge opened to traffic in 1939. With a steep grade, the span carried six lanes of traffic across Newtown Creek, just south of Interstate 495 (LIE). An $800 million project replaces the aging span with two three-lane cable stayed bridges. The New York State Department of Transportation (NYSDOT) awarded a $555 million contract for final design and construction of Phase 1 in June 2014.4 The first of two bridges opened to traffic on April 27, 2017.7 The eventual five-lane Queens-bound span accommodates two-way traffic while crews work on the companion westbound span. The old bridge was imploded on October 1, 2017. The demolition makes way for the eventual Brooklyn-bound bridge for I-278 west as part of Phase 2.8 This four-lane span will include a 20 foot wide bikeway/walkway.5 Phase 2 is scheduled for completion in 2020. More details are available at the Kosciuszko Bridge Project web site. Originally, Interstate 278 was proposed to continue west from U.S. 1 & 9 at Linden to join Interstate 78 and New Jersey 24 at Springfield Township. That extension was canceled when mileage for it was reallotted for construction of Interstate 195 between Trenton and Belmar. Replaced button copy signs posted along Interstate 278 eastbound at the White Plains Road off-ramp (Exit 53). The upcoming Bruckner Interchange represents the transfer of the Cross-Bronx Expressway from I-95 north to I-295 south, and the transfer of the Bruckner Expressway designation from I-278 east to I-95 north. Photo taken 08/09/04. Interstate 278 east defaults onto the continuation of the Bruckner Expressway along Interstate 95 north. Exit 54 departs next for Interstate 295 south to the Throgs Neck Bridge, Interstate 678 south to Whitestone Bridge and Hutchinson River Parkway north to Mt. Vernon. Photo taken 08/09/04. Interstate 278 separates with three lanes joining I-95 north to New Rochelle and New Haven, Connecticut. Departing traffic to the right forms a distributor roadway with ramps for I-295, I-678, Hutchinson River Parkway and local access to Unionport and Schuylerville. Photo taken 08/09/04. A slip ramp parts ways with the distributor roadway for Exit 54 to adjacent Bruckner Boulevard for Zerega Avenue and Hutchinson River Parkway northbound. Photo taken 08/09/04. Interstate 95 angles southwest onto the Bruckner Expressway with three southbound lanes though to the Bruckner Interchange (Exits 6B/A). The Bruckner Expressway transitions onto Interstate 278 from the left as I-95 overtakes the Cross Bronx Expressway from the ending I-295 north. Photo taken by Ian Ligget (04/21/11). Beyond the Randall Avenue off-ramp (Exit 11), Interstate 295 north continues a half mile into the Bruckner Interchange. Exit 12 departs next for Interstate 278 west while the I-295 mainline defaults onto I-95 south. Photo taken 08/29/05. The four lanes of Interstate 295 north cross over Lafayette Avenue ahead of the split for I-95 south to the George Washington Bridge and I-278 west to the RFK (Triboro) Bridge. Photo taken 08/29/05. The Cross Bronx Expressway transitions from I-278 west to I-95 south while I-278 shifts onto the Bruckner Expressway. Interstate 95 trudges west to Parkchester, Mt. Hope and Hudson Heights while I-278 passes through Unionport and Soundview ahead of the Bronx River to Hunts Point. Photo taken 08/29/05. Exiting the Whitestone Bridge main line toll plaza, drivers along Interstate 678 north advance to Lafayette Avenue (Exit 18) and the Bruckner Interchange. There is no connection to Interstate 295 south (Cross Bronx Expressway Extension east) from northbound I-678. Photo taken 08/29/05. Interstate 678 north concludes with two lanes continuing onto Hutchinson River Parkway and three lanes connecting with Interstates 95 and 278 west at the Bruckner Interchange. Photo taken 08/29/05. Removed by 2011, this sign bridge partitioned traffic into the respective ramps for Interstates 95 and 278 west (Exits 19S-W). Photo taken 08/29/05. This button copy sign for the I-278 west and the Bruckner Expressway (Exit 19W) was replaced when the Triboro Bridge was renamed to the Robert F. Kennedy Bridge in 2008. Photo taken 08/29/05. Hutchinson River Parkway south directly transitions to I-678 below the Bruckner Interchange ramps linking Interstates 95, 278 and 295. Exit 1 connects the Hutch with both I-278 (Bruckner Expressway) and I-95 (Cross Bronx Expressway) via Bruckner Boulevard. Photo taken 08/29/05. Exit 1 joins Bruckner Boulevard west ahead of Westchester Creek and local ramps to Interstates 95 south and 278 west. There is no access to I-95 (Bruckner Expressway) north from this direction. Photo taken 08/29/05. Hutchinson River Parkway shifts to expressway standards after passing through the Bruckner Interchange. Traffic continuing south reaches the Whitestone Bridge toll plaza in one mile and Cross Island Parkway in Queens in 2.9 miles. Photo taken 08/29/05. Interstate 278 west lowered from the Goethals Bridge directly into an interchange with Interstate 95 (New Jersey Turnpike). Traffic defaulted onto the ramps for the NJ Turnpike north to Newark and south to New Brunswick while a single lane continued westward along the I-278 spur to Elizabeth. Photo taken by Eric Stuve (07/19/14). The short section of Interstate 278 (part of the planned Union Freeway) between the New Jersey Turnpike and U.S. 1-9 is a relic, with a 50 mile per hour speed limit and older design standards. Photo taken 08/29/05. The roadways of I-278 separate ahead of U.S. 1 & 9. The wide grassy median is leftover from the canceled extension of Interstate 278 northwest to I-78 at Springfield. Planned construction here will add the missing ramps to U.S. 1 & 9 north and from U.S. 1 & 9 south to I-278. Photo taken 08/29/05. Presently Interstate 278 west defaults onto U.S. 1 & 9 south into Linden. 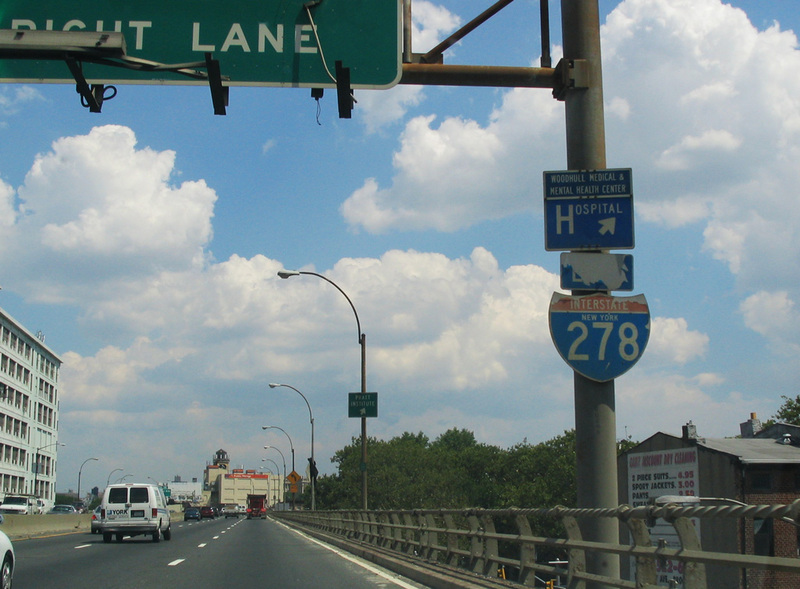 An end sign for I-278 appears ahead of the left-hand merge with U.S. 1 & 9. It includes an erroneous NJ 1-9 shield which remained unchanged as of 2015. Photo taken 08/29/05. The two lanes from I-278 west combine with the three southbound lanes of U.S. 1 & 9 beyond a railroad overpass. Photo taken 08/29/05. Ramps depart from both I-278 west and U.S. 1 & 9 south for left-hand turn for the Phillips 66 Linden Terminal plant entrance. The two roadways combine beyond the ensuing traffic light. Photo taken 08/29/05. A zero milepost stands ahead of the gore point for the plant entrance. This marks the end of Interstate 278 west. Photo taken 08/29/05. Northbound U.S. 1-9 prepare to split with Interstate 278. The nascent freeway begins its eastward trek to the New Jersey Turnpike and the Goethals Bridge into Staten Island, New York. Photo taken 08/29/05. U.S. 1-9 continue north to Elizabeth as Interstate 278 splits east for Staten Island. The wye interchange here will be expanded as part of a $130 million project to improve truck access to Elizabeth from I-278. Photo taken 08/29/05. Replaced button copy sign for Interstate 278 east on U.S. 1 & 9 north. A set of brackets to the left would have supported a sign for I-278 west to Springfield had the freeway been realized. Photo taken 04/10/00. “Cuomo announces official ‘start’ of $1.5B Goethals replacement.” Staten Island Advance, May 4, 2014. “New Goethals Bridge: Installation of stay cables begins.” Staten Island Advance, July 15, 2016. “New Kosciuszko Bridge Work Moving Forward.” Queens Tribune, October 1, 2015. “The Triborough Is Officially the R.F.K. Bridge.” City Room (NY Times) blog, November 19, 2008. “It’s done! New Goethals Bridge opens this weekend. Here are the details.” NJ.com, June 8, 2017. “Governor Cuomo Announces First Span of New Kosciusko Bridge Set to Open on April 27, 2017.” New York State Governor’s Press Office. August 23, 2017. “A Gray Puff, and the Old Kosciuszko Bridge Is No More.” The New York Times, October 1, 2017. “New span of the Goethals Bridge set to open by Monday morning.” Staten Island Advance (NY), May 17, 2018.